Another iPhone, Another Day Of Long Lines And Big Hype : The Two-Way Around the world, excited shoppers are in line to be among the first to get their hands on the iPhone 5. 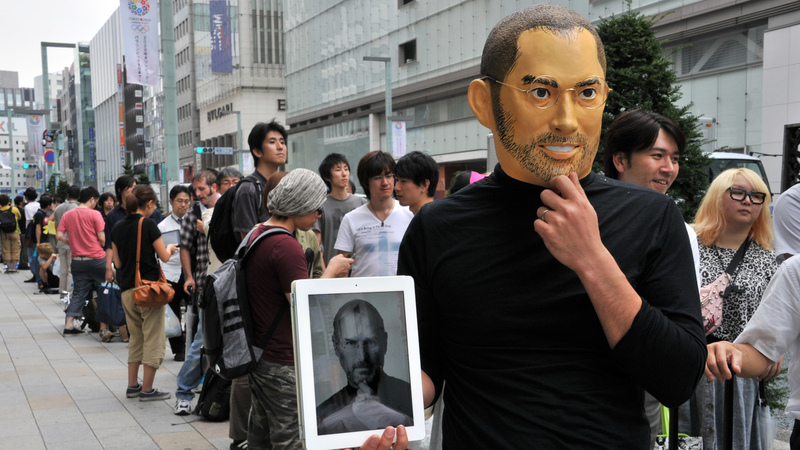 In Tokyo today, a customer on line for the iPhone 5 was wearing a Steve Jobs mask. It's a "now familiar global ritual," as The Associated Press says: Apple fans are lining up today at stores "from Sydney to Paris to pick up the tech juggernaut's latest iPhone." That would be the iPhone 5, which the company unveiled earlier this month. "Osaka police said 191 of Apple's latest must-have smartphone were stolen in the wee hours leading up to the official launch. As of Friday at noon, three stores were hit across Japan's western metropolis in an unusual string of robberies targeting the hottest tech toy this fall." Earlier today, Morning Edition checked in with a guy named Ian DeBorja. He was on line outside an Apple store in San Francisco — and was being paid $55 to hold that place for four hours. It's the first time "he's being paid for his patience," Morning Edition says.